For a quick guide on recycling, download this short version or review the full list below. Paper, Cardboard, Metal & Glass, Electronics, Batteries, Bulbs, and ALL Plastics #1 – #7. Not only is recycling good for the environment and the economy, it’s actually illegal not to recycle most of these things! 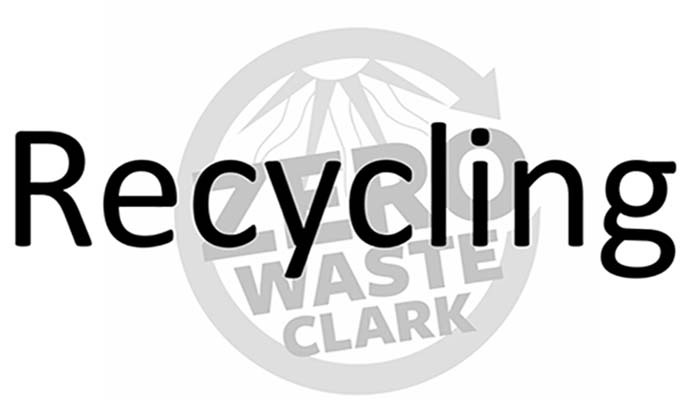 Plus Clark gets direct financial benefit from managing recyclables as the valuable commodities they are. Many other things can be donated or recycled. See the list below for more than 20 other categories & information. Rethink ways you can Reduce: consider packaging when you purchase, bring a cloth bag or just carry a few items, request that on-line shipments be packed in recycled paper – just a few examples! Reuse donate any and all gently-used unwanted items to Clark’s student-run Community Thrift Store. They will find a good home, benefit sustainability and student run ventures, build local economies, and you will get a store discount coupon! Recycle and Compost all you can! For mixed clean paper and plastic/metal/glass are located throughout the Clark campus in residence halls, academic buildings, administrative offices, and common areas. Please use the recycling bins! You know it’s the right thing to do! A recycling bin is never very far away. For organic materials are located in the UC, the AC and residence halls. Faculty and staff offices are provided blue desk side bins for paper and are welcome to designate a box or trash can for recycling plastic/metal/glass – custodians will collect and consolidate recyclables in the building’s central recycling area. Picks up recyclables from every campus building once a week during the academic year. If you need an emergency pick-up or have a question about recycling that is not answered in the FAQ’s or the Recycling Guidelines below please call Sustainable Clark 1-508-793-7601. Located at 499 Park Avenue, collects and processes campus recycling. It also handles responsible recycling of hazardous materials such as florescent light bulbs; electronic waste such as computers (also called e-waste); bulky metal items such as desks. Disposal of oils, solvents, paints and chemicals is managed according to regulations by Facilities Management staff. Please call Facilities Management at 1-508-793-7566 for pick-up of any of these items. Composts all used paper goods (like napkins), food scraps from the kitchen and the cafeteria, and compostable containers, cups and cutlery from the cafes. Please use the slots labeled compost for all of these items when eating in the Den, Jazzman’s or the Bistro. If it was ever alive, you can compost it! Compost bins are all over the UC and the AC, and more bins are located in kitchens and hallways of all residence halls. If you live off-campus, pick up a biodegradable bag from the Help Desk in the UC or use your own container, and bring your organic materials to the compost bins in the AC or UC. Designed, tested and funded by Clark students from 2011-2015, Clark Composts! enables us to divert even more from landfill. Soiled paper, Bistro containers, dryer lint – the list goes on! If it was ever alive, you can compost it! The city of Worcester supports single-stream recycling (combined paper, plastic, glass & metal in one receptacle), and you can get a free recycling bin for curbside pick up. Ask your landlord or search the web for ‘Worcester city recycling program’.